This post is about setting things up and getting unit testing (PHPUnit) and functional testing (Selenium) working for doing PHP development in XAMPP and Netbeans. 7. 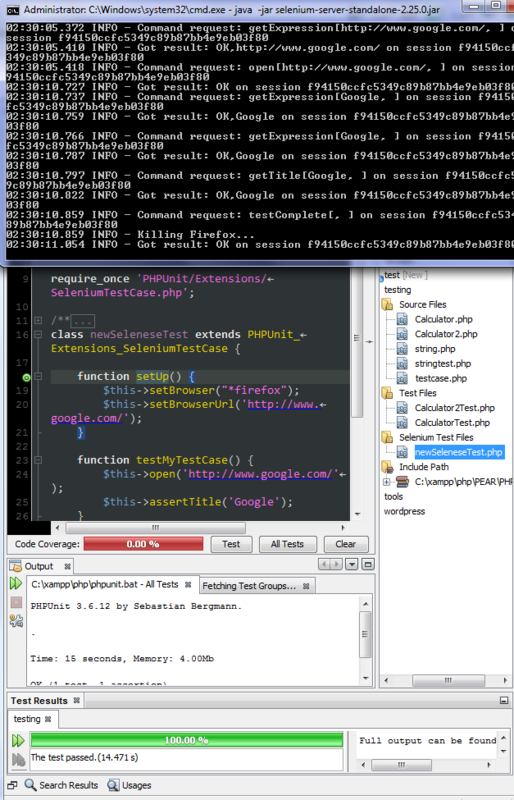 Install Selenium Module for PHP plugin in Netbeans. 8. Write and run your tests! Here’s the end result you’ve been waiting for! There’s also a “Selenium Server” plugin available in Netbeans that takes care of installing the Selenium Server and make sure it’s start-up everytime Netbeans is turned-on. The reason might be it’s using an older version of Selenium Server (2.16.1) (source) while the latest version at the time of writing is 2.25.0. In the end, I opt for manually starting Selenium Server through a *.bat (or you can use command prompt each time too) instead of using the Netbeans Selenium Server plugin. http://netbeans.org/kb/docs/php/phpunit.html (note that I didn’t install testing_selenium-beta, I followed what’s in http://www.phpunit.de/manual/current/en/selenium.html and installed the Selenium Module for PHP plugin in Netbeans instead.